I've been checking out some of my old favorite barbecue joints as well as some new ones for my Yes You Can Grill web site. You can grill all the time, but it is nice to take a break from time to time and let someone else do the work. That's especially true of slow smoked North Carolina barbecue. North Carolina barbecue is pork, and it varies depending on whether you're on the coast (east) or piedmont (Lexington style). The main difference is that east is whole hog with vinegar sauce and piedmont is shoulders with a little tomato (ketchup etc) in a vinegar based sauce (also thin and spicy like the east but with a little red color). Yesterday we were at Wink's which is a favorite here in Salisbury, NC. It's been around a long time. I remember when Wink's was over near the motel on Innes St. They moved over to a bigger spot on Faith Road just past Lowe's off I85. They have been and stir are wood burners. They slow cook the pork out back. You can look and see the big wood pile and the pit. That's what we call real barbecue here in NC, and it's getting harder to find it done the old fashioned way but well worth it. They have a lot of good old Southern side dishes to go with the barbecue at Wink's. 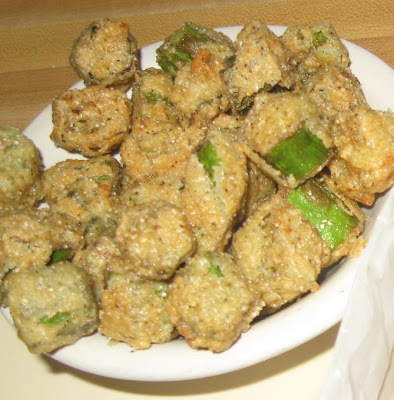 My boys always go for the fries, but okra is my favorite when it's done right. It's done right at Wink's. Yum. Portions are generous at Wink's, but if you have room, they have homemade desserts. You can see here that they have the classic Southern sweets. 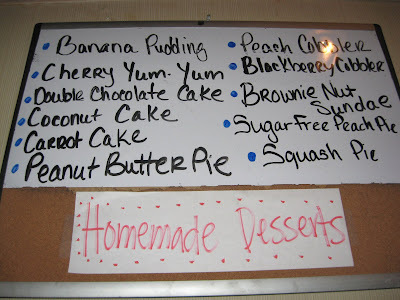 I need to go one day and just get dessert as I always get too full on the barbecue to have dessert. For more on Wink's, see my Wink's review and more photos. 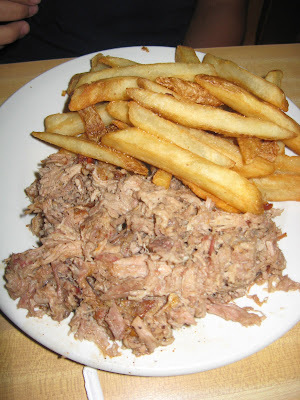 I'm also adding more barbecue restaurants - mostly in North Carolina for now but branching out as I travel more and can get reviews written up. Be sure to tip me off to any favorite barbecue joints in your neck of the woods. I'm always on the look out for great BBQ. Hey Cyndi there is a new Olive Garden in Salisbury. They have a manager named Tish. I met her at a neighbors birthday party yesterday and told her about you. You may want to see if you can swing a deal to help them in some way. I heard we got an Olive Garden but didn't hear where it's at. Will have to look that up. Found this by accident, maybe 'cause I was googling PKgrill of all things! My dad had one yrs ago, we cooked on it all the time ... nice weather, rain, even during a snow storm once! We had a blast. It worked great. I think my sister has it now. And I found out the company was bought and grills are once again being made. Now I have to come up with some $$ so I can get one! That will be my next grill ... soon I hope. 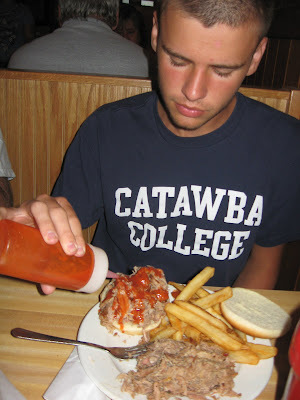 Also, I was reading about NC barbecue. I was born there and often visited family. There was always barbecue around. I recall there was a place in Kinston, NC that we always went to. Also, you can't have barbecue without hushpuppies...it just goes together! OK. That's easy enough. I'll have to check it out. Tks.